The next day I headed into Chicago on a truly spectacular day with a perfectly sunny sky and high 60s temperature. Ironically enough, most of my day would be spent indoors although it made riding the L and walking from stop to stop much easier. First up was The Gage. I had read good things about it plus it was basically across the street from The Art Institute of Chicago where I would be going to after lunch. The Gage is an impressively large restaurant on a recently renovated office building located directly across from Millennium Park. Since I was once again dining solo, I was given a seat in the back of the restaurant along a large banquet, surrounded by a mix of tourists and businessmen having their power lunches. Location aside, my real reason for picking The Gage was to try their venison burger, which had been getting some recent acclaim. I was hoping to pair it with a nice local beer but their selection was pretty wanting. Two of the beers that looked good had already been tapped out so I went with a Goose Island Matilda, which was close enough. The burger soon arrived along side a large dill pickle and fries. It was a perfectly juicy medium rare with pickled shallots, roasted wild mushrooms and smoked gouda. I think the smoked gouda was a bit much as it took away from the burger taste but the pickled shallots added some nice acid to cut through the richness of it all. I was also somewhat disappointed that there wasn’t much of the unique gamey flavor of a typical cut of venison meat but again that also wasn’t helped by the smoked gouda kind of overpowering everything. 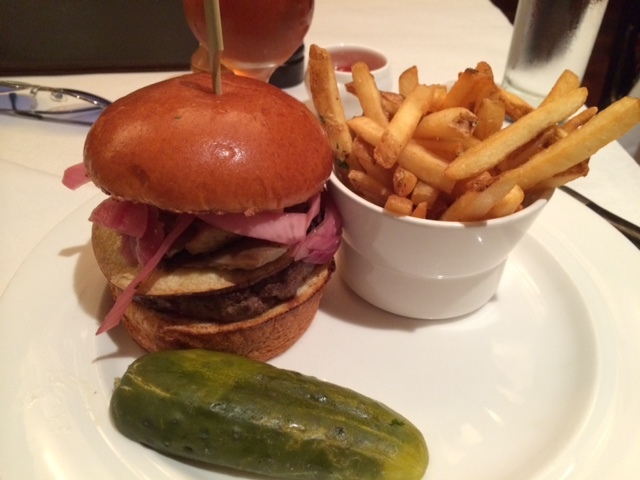 Still, a very good burger that I figured would keep me full until the next feast. The Art Institute turned out to be everything I hoped it would be and more. So many paintings and other works of art that I had studied in college were right in front of me. 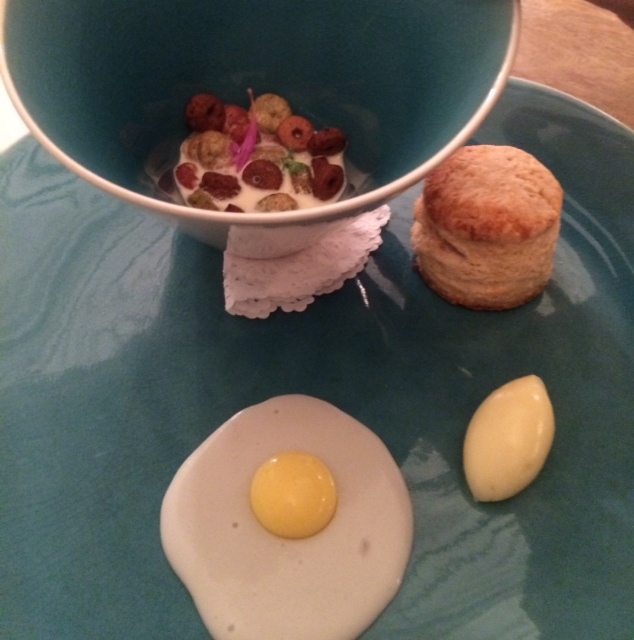 I’ll spare the blow by blow however and carry on to the good stuff – my epic meal at Elizabeth. 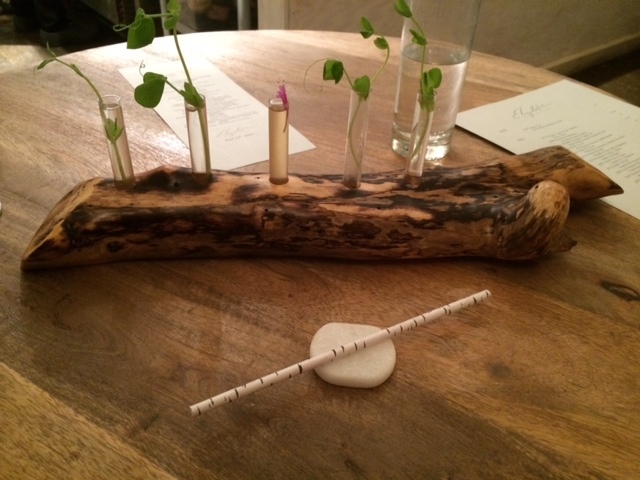 After a failed attempt of getting into Alinea due to the fact they only sell tables in groups of 2, I had stumbled across a restaurant getting a lot of acclaim called Elizabeth. The restaurant used the same ticket system as Alinea and their other properties but in this case, I was allowed to purchase a single ticket. It was quite a different experience having essentially paid for my meal 3 weeks before actually eating it but now the time had finally arrived. The restaurant is located in the new and upcoming area called Lincoln Square, which reminded me a lot of the Mission District in San Francisco. After a quick 10 minute walk from the L station, I entered the small but very cozy Elizabeth. Named after the chef’s sister, the restaurant is known for its combination of modern techniques with locally sourced and even foraged (though don’t tell the health department that!) food. Since I was solo, they had set up a special table right at the edge of the kitchen, which gave me a great view into all of the action. 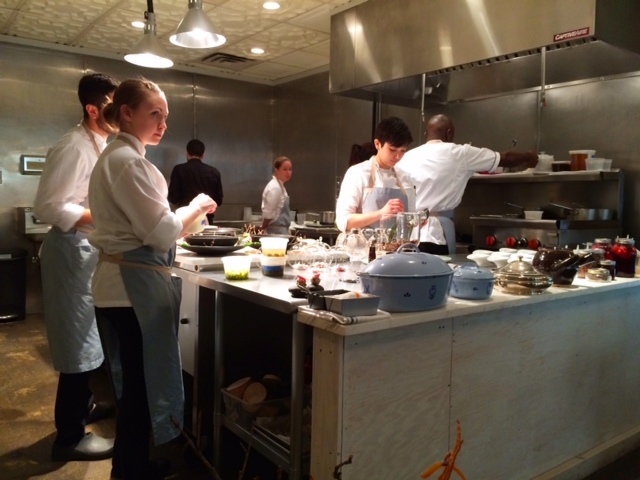 Soon after that, chef Ilana came by to introduce herself and explain the concept. The meal was to consist of 16 courses focusing on fish, meat and vegetables either collected by herself personally or via a very local source. 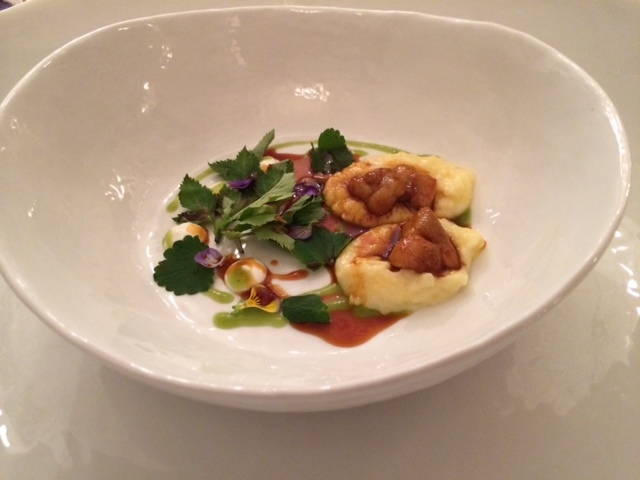 The first “snack” was called “chilled spruce” and cold microgreens along with a sauce made with day lilies, a gelee of day lily and two types of potato. The day lily sauce with the gelee had a very nice brightness and the entire couple of bites did in fact remind me of the smell of spruce trees. A very intriguing start. 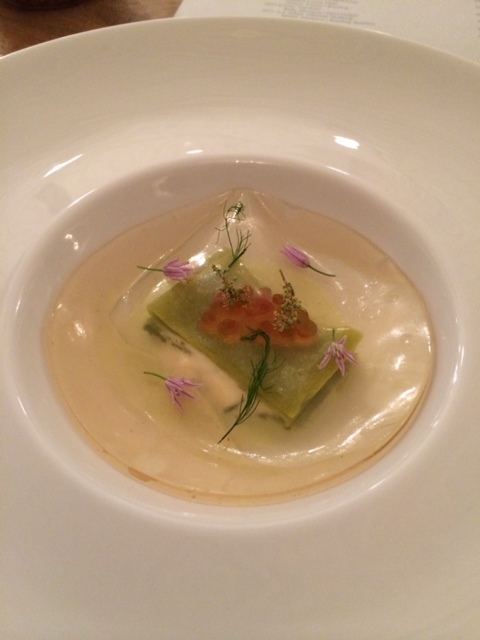 The next course “caviar” was in reality a small lasagna layered with day lily, ramps and topped with fresh white trout roe. This was a real winner as the light vegetables mixed beautifully with the smoky roe. After finishing, I realized that this meal would probably be very special. 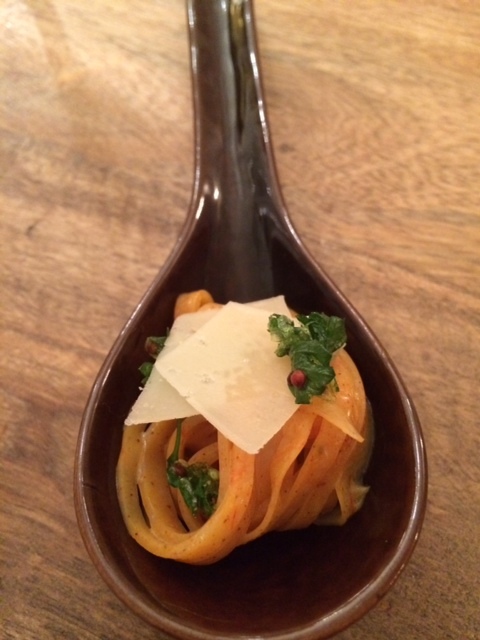 Next up was the first course that showcased the chef’s playful approach to food. 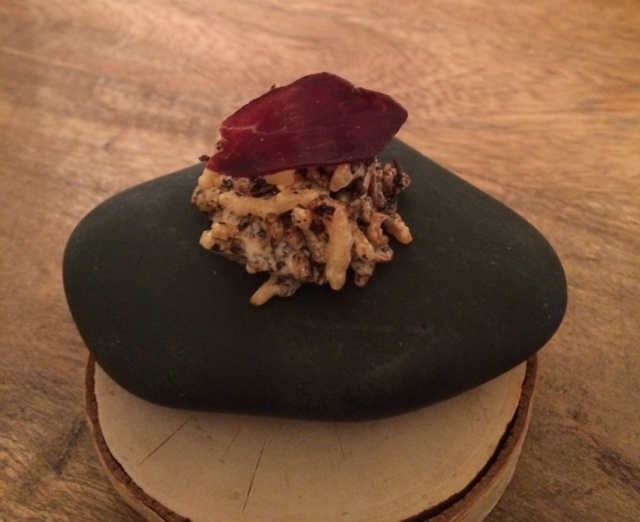 Called “the rock course – wild rice and bear”, I was instructed to use the rock as my dining utensil and to eat it in one bite, calling it an “adult rice crispy treat.” The puffed wild rice had curry powder sprinkled on it and on top sat a piece of bear jerky – yep. I picked up the stone and ate it all in one bite as advised. The rice piece absolutely tasted like a spiced rice crispy treat and the bear jerky, while a bit tough, had a very rich, smoky flavor. My next server told me this course was one that would never leave the chef’s menu. Perfected from her years of doing an underground dining club, it was a string of noodles that had been made entirely out of shrimp. Wow, this was a stunning bite, and I could see why it was such a staple. 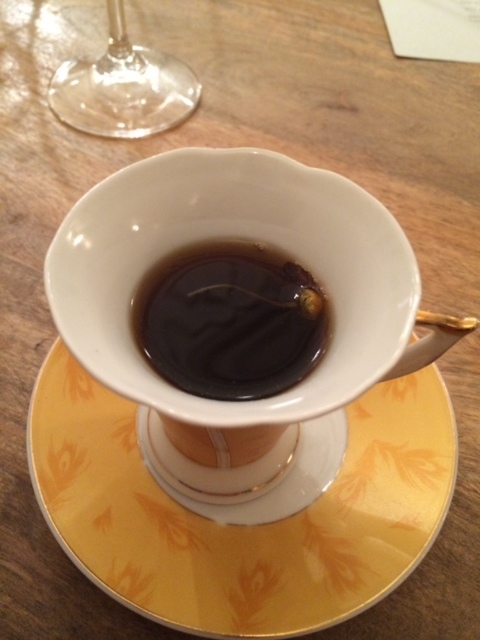 The next course was the “tea course” although in this case the tea was actually a rich mushroom “tea” which had been fortified with bear stock (yep) The stock gave the mushrooms an even deeper flavor and the aroma was amazing. I loved this one. Shortly after I finished the “tea”, a server came over and picked up what I had assumed was just a centerpiece on the table. 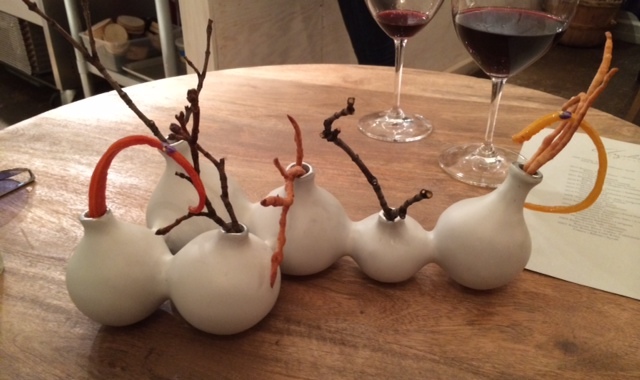 However, it turned out that the ends of the centerpiece here in fact the next course. Local carrots that had been sous vided for 48 hours and then stretched into almost a taffy like consistency. I wasn’t a huge fan of this as the texture was a bit odd but appreciated the creativity. As an amuse to reset the palette, I was presented with what was described as a “red wine meringue” which was paired with some baby carrots and edible flowers. Encouraged to eat it in one bite, the meringue indeed did have a very distinct wine flavor and a nice added crunch by the carrots. A nice way to transition to the heavier courses still to come. 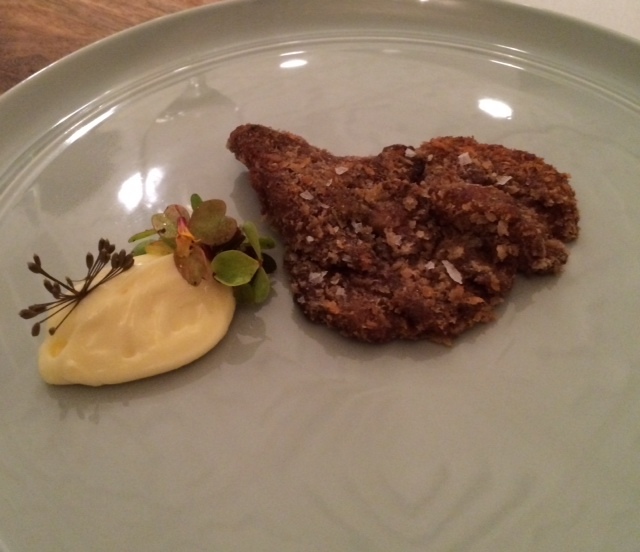 The first of the “knife and fork” courses was a Hen of the Woods fried mushroom, which had been coated in an acorn based powder with a scoop of aioli. Given my garlic issues, I skipped the aioli but the perfectly fried mushroom didn’t really need it anyway. The acorn crust was very crunchy and the earthy, meaty mushroom underneath was delicious. 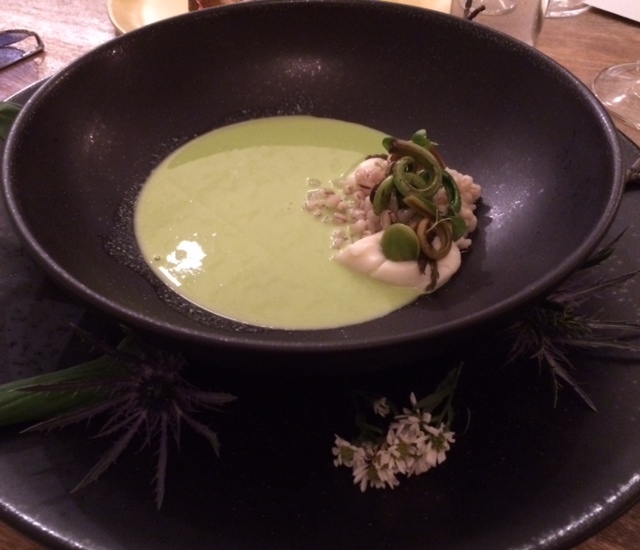 The next course was “soup inspired by greens” It was a fantastic mix of a rich, velvety pea soup with some grilled fiddle head ferns, fava beans and uh, something else I can’t remember (hey this isn’t a food review!) To be perfectly honest, it was during this course I had switched to my 3rd glass of wine and I largely missed the explanation of the various components, which lasted a good 10 seconds. 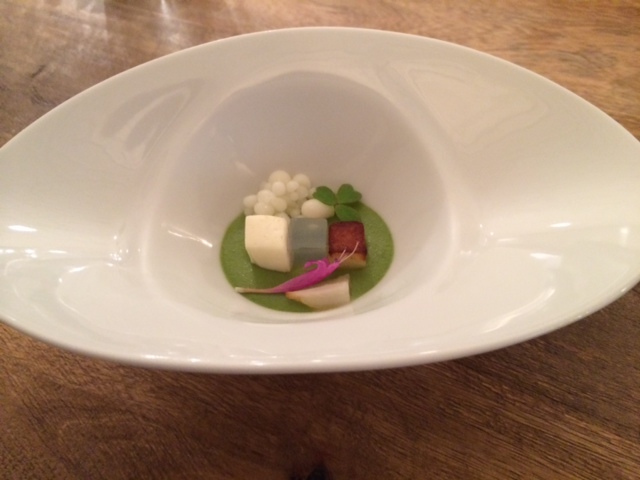 It was another very solid course though despite my slight distaste for fava beans. When the next course arrived “spring greens and sweet breads” I braced myself a bit as sweet breads is probably my least favorite luxury foods to eat. Still, the meal had been excellent so far so I put my trust in the chef. I’m glad I did as it turned out to be a fantastic course. The sweet breads had been poached in a duck and apple sauce and then quickly grilled so it had a much needed texture that is a lot of times missing. It was also a great call to place them on a perfect bed of creamy polenta, which somewhat disguised the very distinct (and to me not great) taste of sweet breads. Chef Iliana presented this extra course herself, explaining that she had been on a hunt yesterday and had noticed some milk weed growing near some mushrooms. 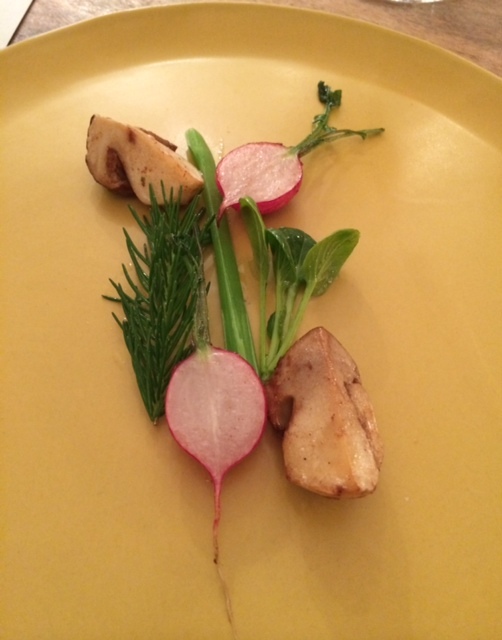 She thought that would be an interesting pairing and added some Hen of the Woods mushrooms, baby bok choy and radishes from her garden to round out the dish. She said the milk weed tasted like a combination of a green bean and an onion, and she was right. After peeling away the fibers, the interior was indeed the mix of bean and onion. Everything else was equally delicious and was a welcome respite from the very heavy previous course. 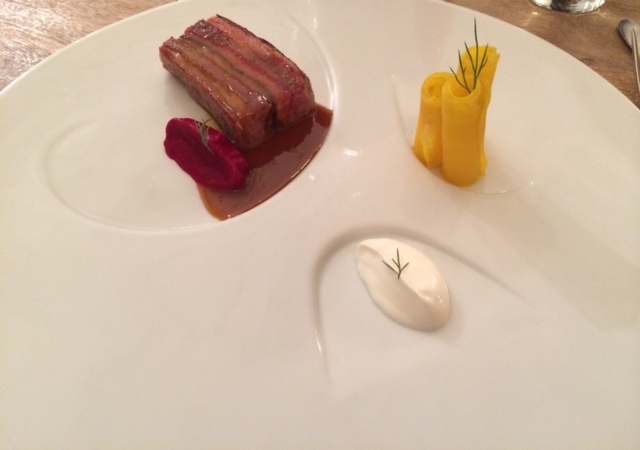 The last savory course was another highlight – “spring lamb and beets.” Rather than a typical cut of lamb, the chef noted she went for lamb belly, which had been slow cooked for 7 days with a ras el hanout spiced braising liquid and then crisped up a bit on the grill. Next to it was a beet and horseradish granita and ribbons of golden beets. After never having lamb belly pretty much ever before, it was amusing to get it for the second time in two nights although this was quite different than Moto’s. The flavor of the lamb belly was full of rich, deep flavor and the bracing granita next to it was the perfect complement. Golden beets are one of my favorites and these crunch ribbons were fantastic. A wonderful way to end the savory courses. As a way to cleanse the palette once again, this very curious set up was placed in front of me. Called “test tubes”, inside each tube was kombucha. As I’m not really a fan, I took a couple of ceremonial sips with the long straw provided and was pretty much done with it. Again, high points though on the creativity scale. The next course though was a home run. Called “fruit loops” it was in fact a crazy mix of porccini, thyme and strawberry (yep) fruit loops with a cashew infused dairy milk that together sure enough tasted like the best fruit loops ever. On the side was an “egg” which was in reality a white custard with a sphere of encapsulated Meyer lemon, which exploded with lemony goodness when bitten into, and if that wasn’t enough, a fantastic buttermilk biscuit (the recipe of which was tweaked to create the fruit loops) and a sweet butter. The mix of flavors, textures and overall just wackiness was off the charts good. I called the chef over to tell her she was a mad genius for coming up with this. Wowza. 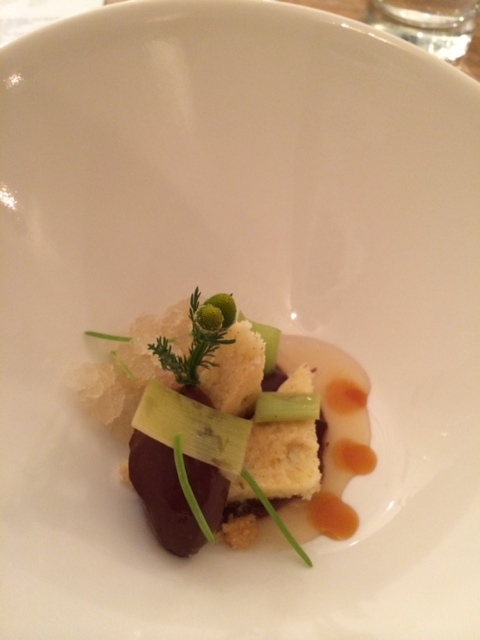 Perhaps realizing nothing would really top that last brilliant dish, the last course downshifted a bit. It even was named basically exactly what it was – “chocolate, chamomile and lily shoots.” The chocolate was a quenelle of dark chocolate ice cream, the chamomile was both in the sauce as well as encapsulated into small spheres, and the lily shoots had been candied. Oh and there was also a piece of shortbread and a lemon granita on the side. After just over 3 hours, I waved the white flag and couldn’t even finish the small cookies given as a final bite. I stood up to applaud the kitchen staff who smiled and bowed in my direction. Easily one of my favorite meals of 2014 and way up there with all time meals. There is no doubt whenever I’m back in Chicago, Elizabeth will be on my agenda once again. Posted on June 18, 2014 by reyalto. Bookmark the permalink.